Offering 4 star accommodation in the heart of the commercial and entertainment district of Kowloon, Gateway Marco Polo Hotel is conveniently situated within walking distance of a number of transport options. Part of Hong Kong's largest shopping complex, Harbour City, the hotel offers a fantastic range of shopping opportunities as well as a great range of onsite facilities and is close to a number of popular attractions including the Avenue of Stars, China Ferry Terminal and more. Located just a short distance to the Kai Tak Cruise Terminal, MTR Hunghom Station and an array of shopping, entertainment and dining venues, Harbour Plaza 8 Degrees is ideally situated for guests to explore Kowloon. Harbour Plaza 8 Degrees offers a great range of facilities including a fitness centre, local shuttle, swimming pool, sauna, restaurants and bars. The range of rooms will suite couples or families alike and feature air conditioning, WiFi access and satellite TV. Holiday Inn Golden Mile is a great value accommodation located amongst the hustle and bustle of Tsim Sha Tsui, Kowloon. Featuring a swimming pool, restaurant, bar and fitness centre, Holiday Inn Golden Mile is ideal for couples, families and business travellers. The architecturally designed Hotel ICON is situated in Tsimshatsui East Kowloon and offers modern 4.5 star accommodation that enjoys stunning views of the city skyline, Victoria Harbour and Hong Kong Island. Conveniently located within walking distance of MTR stations, the hotel is just minutes from popular attractions including Hong Kong Museum of History, Causeway Bay, Hong Kong Coliseum, Wan Chai District, Hung Hom Star Ferry Pier and Harbour City. The hotel also boasts the world's largest indoor vertical garden, designed by famous botanist Patrick Blanc. Located in Kowloon's Tsim Sha Tsui district, Hotel Panorama by Rhombus is renowned for its deluxe, triangular building known as the tallest in the region. Enjoying stunning views of Victoria Harbour, the hotel offers 4 star accommodation conveniently close to the MTR network, ferries, taxis, buses and a range of public transport. The hotel is also just minutes from a popular range of attractions including the Hong Kong Coliseum and Avenue of Stars and a number of famous shopping destinations including iSQUARE, DFS Galleria and the boutique stores and Art Mall of K11. Centrally located in the CBD of Kowloon, Hyatt Regency Hong Kong, Tsim Sha Tsui is set on Hanoi Road in the prestigious K11 complex, renowned as the tallest skyscraper in Kowloon. Aside from its iconic building, the hotel is renowned for its 4.5 star accommodation and great onsite facilities including boutique shopping and Art Mall. The hotel is also close to a range of popular attractions including iSQUARE, Avenue of Stars and Harbour City. This Hong Kong accommodation is perfect for those who a looking for a little luxury, InterContinental Grand Stanford Hong Kong is a five star hotel that caters for both business and leisure travellers. Choose from city or harbour views from the modern and comfortable rooms and enjoy the use of the facilities that are right at your fingertips including an outdoor swimming pool & spa, gym, business centre, health spa and more. InterContinental Hong Kong is a luxury hotel located in Kowloon. This Hong Kong accommodation features restaurants, bars, spa, swimming pool and offers amazing views of Victoria Harbour and Hong Kong Island. Located in Tsim Sha Tsui, Kowloon Shangri-La, Hong Kong offers luxury accommodation with views of Victoria Harbour. Conveniently close to the airport and the district of Mongkok, the hotel also enjoys easy access to the Ladies Market, K11 Shopping Mall, Nathan Road, Harbour City, the Avenue of Stars and Hong Kong Disneyland. Located in the Harbour City complex, Marco Polo Hongkong Hotel offers 4.5 star accommodation overlooking Victoria Harbour and as part of Hong Kong's largest shopping complex. Situated adjacent to Star Ferry and the Hong Kong cruise terminal, the hotel offers a great range of onsite facilities and is close to a number of attractions including Kowloon Park, the Hong Kong Cultural Centre, Space Museum, the Hong Kong Museum of Art and Avenue of Stars. Park Hotel Hong Kong is centrally located in Kowloon, close to entertainment and business venues and activities. This exciting area of Hong Kong has a buzzing nightlife and an array of shopping and dining options for guests to explore. Park Hotel Hong Kong features modern rooms with free WiFi, as well as hotel facilities such as a restaurant & bar, fitness rooms and meeting rooms. Located right next to the China Ferry Terminal on the Kowloon waterfront, Prince Marco Polo Hotel offers 4 star accommodation on Canton Road in Tsim Sha Tsui. Just footsteps from Harbour City, Hong Kong's largest shopping complex, the hotel boasts a great range of onsite facilities and is close to a number of popular attractions including the Hong Kong Heritage Discovery Centre, Space Museum, Avenue of Stars, Hong Kong Museum of Art and Kowloon Park. Centrally located to Kowloon's shopping, entertainment, business and dining district on Nathan Road, Sheraton Hong Kong Hotel & Towers offers 5 star accommodation at the top of the famous 'Golden Mile'. 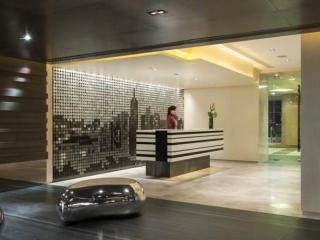 Home to a great range of onsite facilities, the hotel faces Victoria Harbour and is only minutes from Hong Kong Island. Close to the MTR network and the Star Ferry, the hotel offers easy access to public transport and a number of popular attractions including the Hong Kong Space Museum, Hong Kong Museum of Art, Avenue of Stars and Harbour City. Located in central Kowloon in the Tsim Sha Tsui district, The Luxe Manor offers European-style 4 star accommodation uniquely inspired by the surreal artwork of post-modern artist Salvador Dali. With interiors that transport you to a fairy-tale-like world, the hotel is as much of an attraction as the local shopping, dining, entertainment and tourist sights. Conveniently close to the MTR network and public transport, the hotel also enjoys a great range of onsite facilities and is close to the airport. Located in the heart of Kowloon's shopping, dining and entertainment precinct on lively Nathan Road, The Mira Hong Kong Hotel offers deluxe 5 star accommodation and a Michelin star restaurant directly connected to the Miramar Shopping Centre. Within minutes of popular attractions such as the Avenue of Stars and Hong Kong Coliseum, the hotel also enjoys easy access to public transport including the Star Pier Ferry and MTR station. Located on Kowloon's Tsimshatsui East district, The Royal Garden offers 5 star accommodation close to a range of public transport and tourist attractions. The only hotel in Hong Kong with an 110 foot air conditioned garden atrium, the hotel offers an excellent range of onsite facilities and is located within walking distance of the Hong Kong Museum of History and Hong Kong Space Museum and close to Nathan Road and Harbour City. Enjoying beautiful views of Victoria Harbour and Hong Kong Island, The Salisbury - YMCA of Hong Kong offers comfortable accommodation on the tip of the Kowloon Peninsula. Situated in the heart of the Tsimshatsui CBD, the hotel is surrounded by shopping, dining and entertainment and is conveniently close to the MTR network, bus services, the Ferry Terminal and other public transport putting you just minutes from popular attractions such as the Cultural Centre, Space Museum, Hong Kong Coliseum, Historic Clock Tower, Museum of Art, Waterfront Promenade, Nathan Road and Avenue of Stars. Kowloon accommodation enjoys stylish rooms and suites with picturesque views of Victoria Harbour and is close to a range of popular shopping, dining and attractions.